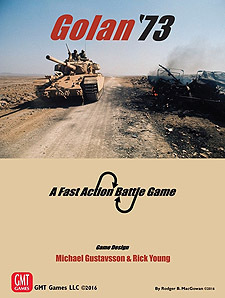 The Fast Action Battle (FAB) game series, designed by Rick Young (Europe Engulfed, Asia Engulfed, FAB: The Bules and FAB: Sicily) joins the efforts of Rick Young and Michael Gustavsson who together take you now to the opening days of the Arab-Israeli War in 1973 for Volume III in the FAB Series. This volume of the series takes you to the Golan Heights on October 6, 1973 where during the holiday of Yom Kippur, the silence on the Heights was disrupted by the thunder of tanks, guns, and aircraft as a Syrian assault was suddenly launched. The Syrian operation, code-named as Badr, was aimed to retake the Israeli-occupied Golan Heights, which the Syrians lost in the 1967 Six-day war. In Fast Action Battles: Golan '73, you will command highly mechanized forces and manoeuvre them across the rocky terrain of the Golan Heights. Unlike previous volumes where rugged terrain was more simply modelled for its impact on armour and infantry, this volume highlights a variety of natural and man-made terrain barriers that post the appropriate combat challenges to the modern mechanized forces, such as differentiating the impact of river versus wadi or rugged mountain terrain versus escarpment, and accounting for the impact of the strongpoints and massive anti-tank barriers along the Purple Line. Both sides must prepare an aggressive plan to overcome these physical barriers. Each side faces challenges organizationally as reflected by the asymmetry of unit size and the difficulties presented by the terrain of the battlefield. You may find it particularly difficult to maintain unit integrity when combat results disarrange formations from maintaining superior geographical position versus the enemy. Battle-specific events include Operation Dugman 5, Electronic Warfare, Counterbattery fire, Lt. Zvicka Greengold, the Syrian FROG-7 missile strike and more. Can you punch through and cross the Jordan as the Syrian commander? Can you stem the tide until reinforcements arrive allowing you to counterattack as the Israeli counterpart? Play Fast Action Battles: Golan '73 and find out!